Something amazing is getting ready to start annually right here in Montana...The Big Sky Songwriters Festival! Bringing an amazing opportunity for anyone wanting to become a better songwriter, learn about the dynamics of music publishing and find ways to have your music heard! In their first year, the Big Sky Songwriters Festival has created an incredible environment and a tremendous array of songwriting talent to work with all attendees. Event founder Dave Goodwin, who has shared residence between Montana and Nashville over the years, knew that Big Sky provides a location for pure creativity and nurturing of the creative spirit combined with the comforts provided by a world class resort like Big Sky. The goal is to help creative individuals and those who want to learn the craft of songwriting by providing access to some of the very best in the business to guide them. Year one instructors include Rory Feek (Some Beach-Blake Shelton), Steve Bogard (Praying For Daylight-Rascall Flatts), Chas Sanford (Missing You-John Waite/Tina Turner), Kostas (Blame It On Your Heart-Patty Loveless) , Jon Mabe(The Climb-Miley Cyrus), Bruce Burch(Rumor Has It-Reba McEntire), James House(Broken Wing-Martina McBride),Suzi Ragsdale(Pam Tillis,Darrell Scoot...others), Austin Troubadors Walt Wilkins, Kevin & Dustin Welch, Montanas John Bohlinger, Paul Durham (Black Lab), Jon Pousette-Dart( Amnesia) and many others...stay posted. Also several industry leaders are scheduled for workshops as well including Dennis Lord(SESAC), Sara Johnson(Sr Creative Director BMG/Chrysalis), Juli Newton Griffith(Sr. Director Magic Mustang Music Publishing"Jason Aldean") to help registrants learn more about the ins and outs of not only songwriting...but also publishing, legals and the music business in general. And each evening BSSF will host exclusive live performances by many of the participating instructors and special guests. Each night of the festival will bring an intimate performance to the Whiskey Jack at Big Sky on the nights of Aug 16,17,18 including many of the Instructors and some surprise guests! Announcements of the schedule will be in the next issue of the Bozone! Attendees will find themselves in one of the most breathtaking settings in North America as their creativity grows by participating in songwriting workshops, seminars, panels and live performances at the foot of our own majestic Lone Peak in Big Sky and be a part of the first event of this caliber to be held in Montana . Led by some of the music industry's most successful songwriters, musicians, and publishers... they will be inspired about your craft and the business of music in a unique and stunning setting experienced by few. And all affordable to everyone..and for those requiring accommodations...Big Sky is offering an amazing deal to registrants! Big Sky Resort is a 3,600-acre resort located in southwestern Montana in Madison County, an hour south of Bozeman via U.S. Highway 191 in Big Sky. During the Big Sky Songwriters Festival horseback riding, hiking, amazing ziplining, mountain biking the trails on the mountain and for the first time this year you can take the tram to the very peak of Lone Mountain and take in over 20 mountain ranges. Down from the Mountain Village complex... golf, and tennis and much more are available in the Meadow Village, which sits at an elevation of 6,800 feet, between the ski area and US-191. Fly fishing and whitewater rafting are popular on the Gallatin River (from "River Runs Through It"). Lake kayaking is available at Hebgen Lake 50 miles south. Big Sky is a convenient and comfortable base camp for excursions into nearby Yellowstone National Park and several National Forests. Location location location! 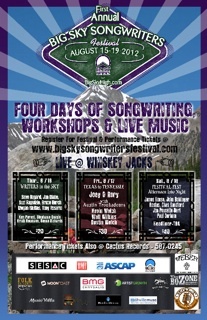 Visit the site www.bigskysongwritersfestival.com and take advantage of early registration NOW!